and steam fittings . . . 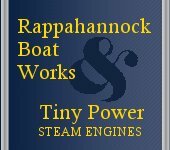 Boats - We build custom-designed wood steam launches up to 30 feet in length. We build from the ground up, partial builds, or outfit existing fiberglass or wood hulls. Engines - We build full-size steam engines for boats, and we also sell our engine castings for the do-it-yourselfer. Model Engines - We sell steam engine model kits for the hobbyist. Boilers - We sell ASME code boilers manufactured to our specifications, and blueprints for a 30 sq. ft. water tube boiler. Steam Fittings & Accessories - We sell reflex water gauges, lubricators, drip oilers, valves, pressure gauges, injectors, pipe fittings, etc.--everything you need for your steam project. Name Boards - We design and make wooden name boards for boats, or paint boat names on hulls. Our steam launch projects are always one-of-a-kind, featuring unique styles, colors and components. You'll get quality and great attention to fine detail with each engine we build. Look at our .pdf catalog here. Or, order one. Charles V. Arnold's Tiny Power. Historic photos and memorabilia of Tiny Power's founder. Link. Are you thinking of using a steam engine to generate electricity? Read this first.